I’m fresh back from the Utah Pipe Band’s inaugural David Barclay Memorial competition. It was very smart of the UPB to organize an indoor competition at a time when next season seems so far off. The competition was well-supported and well-organized, despite the biggest snowstorm of the season showing up as a snowy white background out the windows. This was my first time competing since Payson back in July, and it would appear that I have improved a little. I managed two 5th places out of a field of about 12-15 in Grade 4 – results I was more than happy with. A late entry to the Grade 4 piobaireachd robbed me of the 1st place I was sure was mine (I was the only entrant initially) but that was OK – I was happy with how I played and the judge, Jack Cairney, gave me some very helpful advice afterwards. 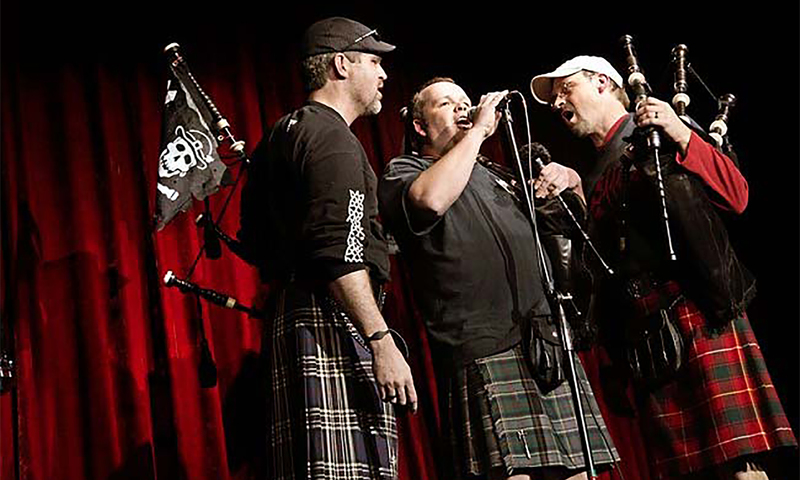 Thank you Utah Pipe Band – you did a good thing, and I hope the competition comes back next year. I Play in a Grade 3 Band! Yesterday WUSPBA, the Western United States Pipe Band Association, made it official – my band, The Wasatch and District Pipe Band has been moved up to Grade 3. This move is clearly the consequence of some very hard work on the part of those involved in the running of our band, and the band members themselves. The team of Andrew Morrill, Ross Morrill, Mike Postma and Justin Howland have created the conditions where this could happen. Andrew, our Pipe Major, has pushed the band (in the friendliest possible way) all season, never letting up and being relentlessly positive. Ross has tamed the beast that is tuning 20+ pipers, so that our unison playing sounds so sweet – you can hear the results of his pipe set-up in this video of the band playing at Pleasanton this past Fall. Mike, our Drum Sergeant, set a bewildering list of new standards for the drum corps at the beginning of the season, all of which they exceeded. The consequence of this was that the drummers actually outperformed the pipers. I hope they’re still willing to play with us! Justin provided the all-important guidance that shaped our playing of the tunes. It makes a big difference to have that particular set of critical ears constantly monitoring our playing – I never leave a rehearsal without some nugget of useful information that improves my playing. I’m pretty sure also that the level of solo piping and drumming has helped the band as a whole. A significant number of the players compete, and do very well. The depth of the pipe corps is evidenced also by the number of pipers playing piobaireachd. We are not just Jig and Reel players – we want to get to the soul of the music! All this adds up to a band that is improving very quickly. This progress does however present the band with some new challenges: We currently have between 20 and 30 pipers. That’s too many for one playing band, but maybe not quite enough for a Grade 3 and a Grade 4 band The problem here is that everybody may be too good – how do you decide the roster of the Grade 4 band? I’ll start that particular ball rolling and volunteer myself! Another new challenge will be how to find competition to play against locally. The Salt Lake Scots are a Grade 3 band, but that’s it for Utah. Travel has been a topic of conversation this past week or so, because of the attendant expense involved in taking so many players to out-of-state games. In any case, I’m sure all this will be worked out, and for now Congratulations to all. This is a great band to be in, and I’m sure we will all prove worthy of our new standing! My previous post drew some comment about whether or not one had to be very experienced to interpret piobaireachd well. I have an article written by Jim McGillivray called “Piobaireachd Technique: Perspiration before Inspiration”. Jim is very experienced player and competitor, so when he speaks on the subject, it’s usually worth listening to. The article was given to me as a photocopy by my old Pipe Major, so I can’t tell you where it’s from, but I think it is from an old copy of the magazine “The Voice”. The article is basically in two parts: the first a short essay on why good technique is so important, and the second a description of the more common movements in piobaireachd, and how to nail them! What is interesting to me is how Jim puts technique into perspective. He makes the case for practicing all the movements (edres, taorluaths, crunluaths, etc.) relentlessly, until you can play them effortlessly. You have to put in the repetitive work, before you can play the tunes well. If you’re thinking about the gracenotes, the argument goes, then you can’t feel the song. I think this is a really interesting point, and it gets to the heart of balance in performing any kind of music. Flawless technique, devoid of expression can be produced by a robot, and is boring to listen to. (When my daughter took Suzuki-method violin classes briefly, we learned this the hard way.) On the other hand, the enthusiastic and motivated performer playing a tune that is obviously too hard for them can be just as painful. (That’s me, playing my 2/4 march at the Salt Lake Games this past Summer.) Expression is vital, (or the music will not be), but you need to have at least a minimum level of technique to execute the tune you’re attempting to play. A highlight of the games I mentioned was hearing Alex Morrill, one of our younger band members, play Struan Robertson’s Salute. He had a few note errors here and there, which is to be expected – he was playing in Grade 3, but he clearly had adequate technique for the task at hand, and he gave what I thought was a very beautiful performance. I guess John Partanen (the adjucator) agreed, because I think Alex got first place that day. Anyway, my point is that as long as you are able to play the notes and the gracenotes on a well-tuned, steady pipe, and you can keep it up to the end of the tune, you then need to add your personal take on the expression and you will be ready to give your listeners a performance to remember. From there, the only way is up!